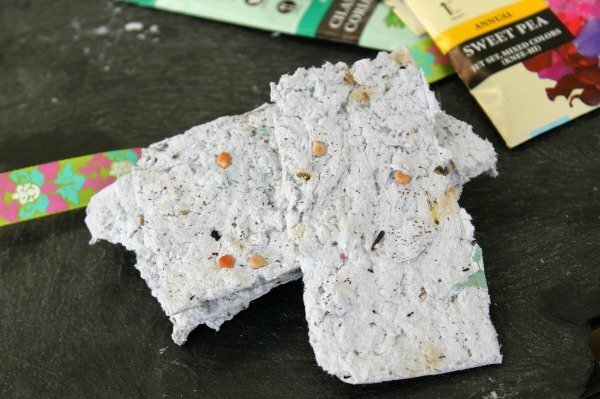 Homemade seed paper is the perfect party favor for bridal or baby showers, tucked into a welcome basket for a new neighbor, or for your own use planted in pots and garden plots. 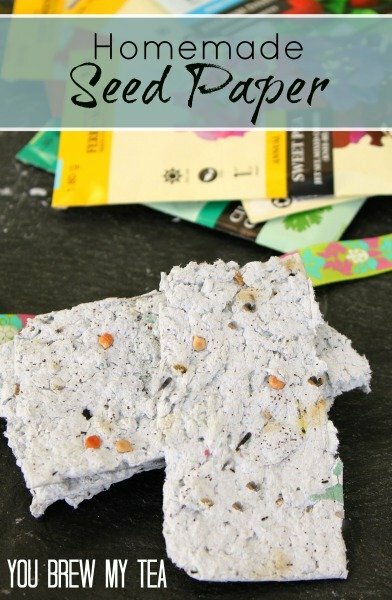 It is super easy to make, inexpensive, very earth friendly, and the kids love to help! It is also very easy to color to match any event or theme, either use colored paper or add a few drops of food coloring until desired color is reached. 6-8 pieces of colored paper- construction or scrapbook,etc. Tear paper up into 2″ pieces and place in blender. 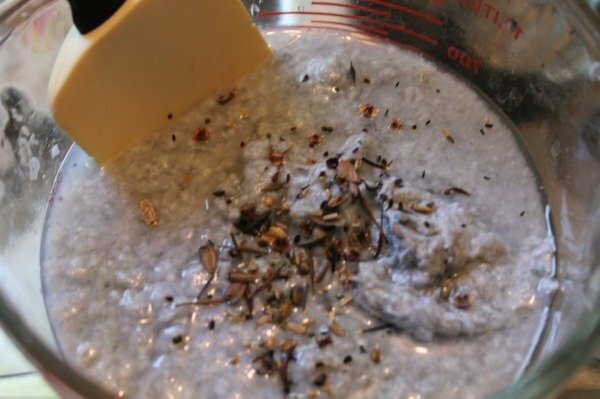 Cover with warm water, replace lid, and blend until a pulp forms. Stir in seeds, you can add as much or as little as you like, I tend to go overboard, once planted and they begin sprouting it is easy to thin them out. I chose a wildflower seed mix for this batch. So there are all kinds of really cool tutorials to make your own paper screen using window screen, I went the lazy time and labor saving route and just used an old window screen we had laying around. I just spread my pulp out on the screen with a spatula until smooth and thin. 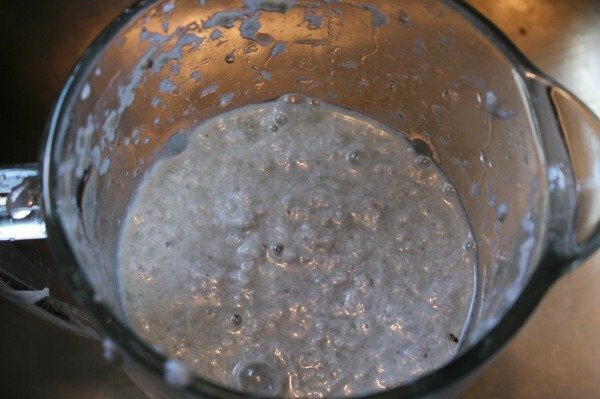 Press down with a towel/paper towel to absorb some of the liquid and cut drying time. I leave mine overnight. 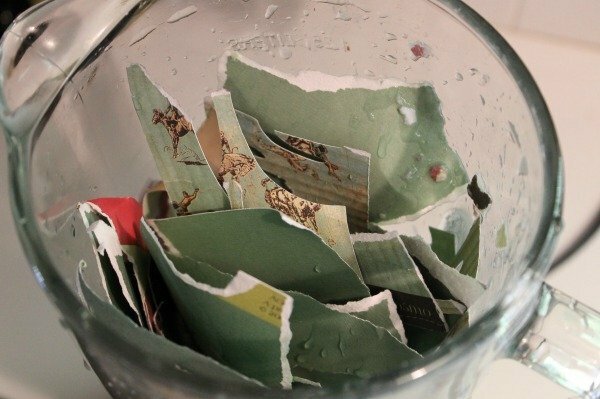 Cut your seed paper into strips, shapes, or small sheets. Punch a hole, run ribbon through it and use is as a gift tag or bookmark if you like. We are going to tuck these in a pretty pot with some garden gloves, a few additional seed packets, and a trowel for a fun gift. We love making useful upcycled or recycled gifts for our friends. Not only are they frugal, but thy are better for the environment. This is one of the most fun craft projects we have made because it serves so many purposes. 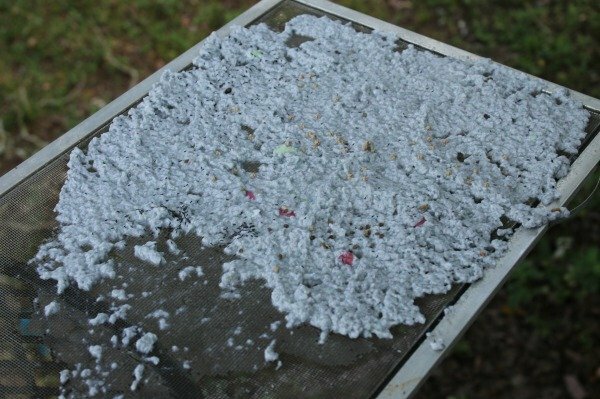 Not only does it recycle scrap paper, it is a great homeschool lesson for our children. 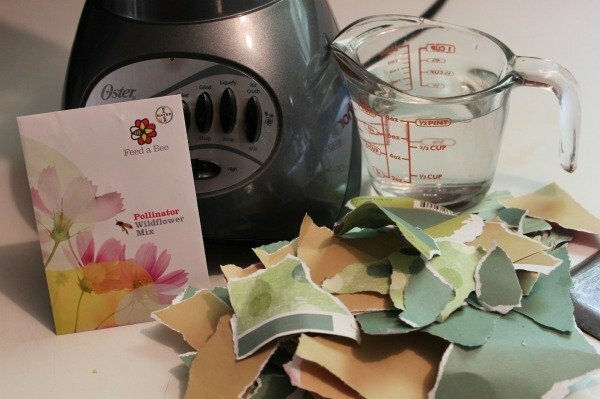 You can use it to teach about plant life, recycling and following instructions. On top of that, it is a great gardening craft for starter gardens for your kids. Check out some of our other favorite crafts, upcycle and DIY projects! this is such a great project! I invite you to share at my Thursday Favorite Things blog hop, you can link up tonight at 7PM ( MST) through Saturday at midnight. hugs! Thanks! We’ll see you there! Oh, I just love this idea. What a cute and useful little addition to a gift. Pinned! Thanks for the invite! I’ll check it out! I got a seed paper heart as a wedding favor once, it was such a great gift! It is such a cool project! Pinning this so I can do it! Wouldn’t these be great to put inside of Christmas cards! So glad you shared at Merry Monday. These are awesome! I’m planning on making them as my wedding favor this August. Quick question: How would you store them? Do they store easily? I was planning on making these ahead of time so that I’m not stuck with the big project a week before the wedding. How long before the wedding can I make them?